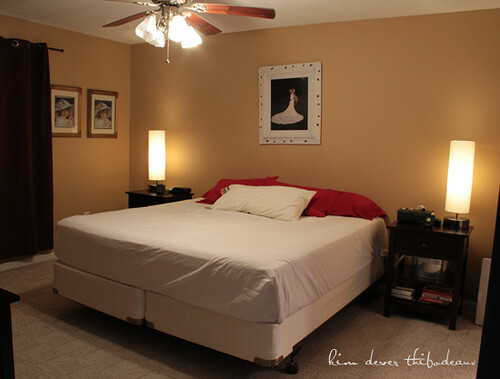 encore: Master Bedroom Makeover : : Let the Games Begin! Since Winter has abandoned South Louisiana, we started spring-cleaning early. Not your average, run-of-the-mill cleaning. Oh no. We're talking major . Like carpeting. Yep, ripping it out. Our home was built circa 1997, but we bought it in 2005. And it's time to make it "ours". So, if we're ripping out the carpeting, what better time to paint, right? And what about that archway between the living room and the dining area? Let's get rid of that, too! Oh,and the big plate glass mirrors in the bathrooms. Let's frame them. And what about...You can see what kind of year this is going to be. I've decided to chronicle our adventures as Weekend Warriors so that maybe I can inspire others to do the same. After all, it's other people's blogs (and years of HGTV) that have given me the confidence that we can do it ourselves. Our to-do list is long, so we have come up with a strategy. We've never installed wood floors, so we're going to start in our bedroom, then work our way out to the living room and then into the dining area. The plan is to know what we're doing by the time we're finished with the bedroom. Pretty smart, huh? 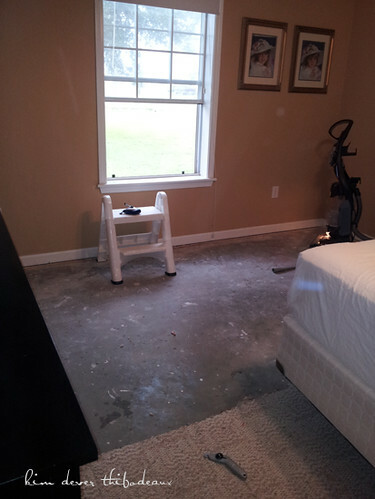 So here's our room, ready for the carpet-ectomy. ...and here it is with a section of carpet gone. There's so much to do in this room. I can't wait! First, the walls are going from the mustard gold color to a calming, watery blueish-green. It's going to look so nice with glossy white trim (yep, it's getting repainted, too). 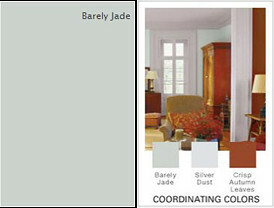 We agreed on Glidden's Duo Paint & Primer Barely Jade in a flat finish, which we picked up from Home Depot. It won't be long before we're on a first name basis with their employees. We go to the Broussard location and have had great customer service. Our furniture has a dark coffee finish that is just going to pop against the color. I think the watery color on the walls combined with the dark woods gives it a spa-like feeling. 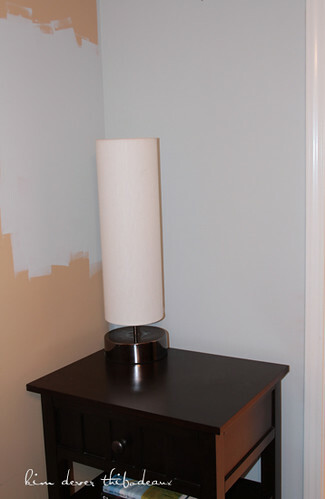 I painted a small portion of the wall and staged a nightstand in front of it for effect. I should note that the paint went on nicely and I got one-coat coverage, which I hadn't expected given how dark the wall color is. 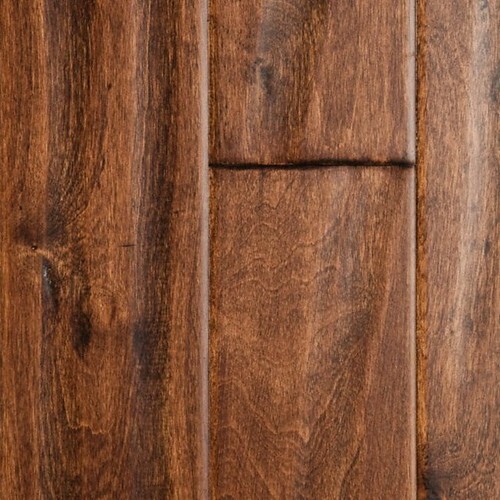 For the floors, we selected Virginia Mill Works Engineered Handscraped 1/2" x 5" Potomac Plank. The hand-scraping gives it a wavy, worn surface and the satin finish will stand up to the dogs. We purchased the flooring from Lumber Liquidators in Broussard, Louisiana. They are open late until 7:00 p.m. on Thursdays and the staff is very friendly and helpful. We thought we would have to settle for laminate flooring but learned that we could actually afford real wood plank flooring. Best of all, we got 18 months interest-free financing! 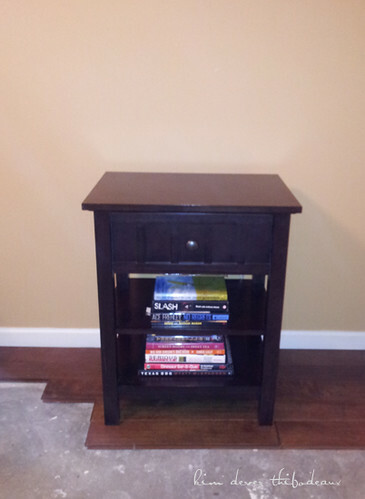 I staged a nightstand with a few planks to get an idea of what it will look like. The color is a bit off in this photo since I shot it with my phone. The LED flash is cool so the nightstand looks purple. I just don't feel like color correcting it. Don't judge. Once we get the walls painted and the flooring installed, Sean is going to construct built-in bookcases with cabinets at the bottom and a window seat along the front wall. We'll give it a nice coat of white paint so that it becomes an architectural detail in the room. Then we'll finish off the room with white crown molding - a detail that is missing throughout our entire home. I'm going to re-frame the girls' portraits and my wedding portrait in sleek wood frames and relocate them. 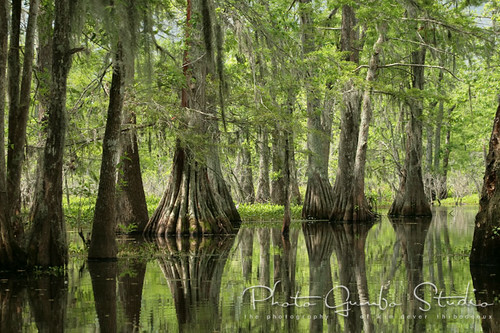 Over the bed, I'm going to hang three individual matted, framed prints created from this one photo. I'm sure that project will warrant its own blog entry. 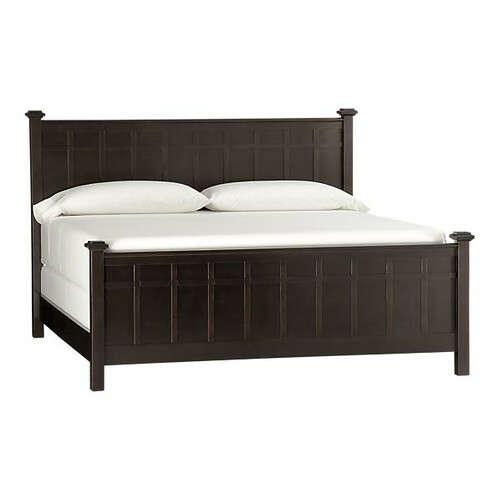 When the room is complete, we're going to reward ourselves by finally purchasing the bed that matches our dresser and nightstands. I don't particularly care for matched furniture, but my husband is a stickler about matching furniture and symmetry and that's OK, too. If there's a secret to being married for 22 years as we have, it's learning how to compromise. 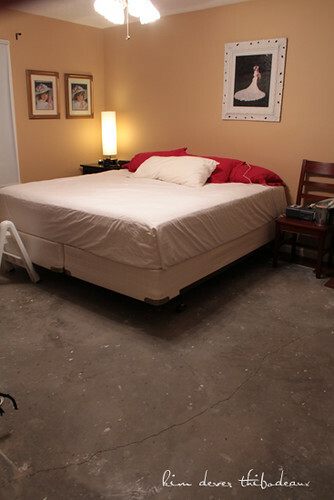 Here's what the bed looks like. It's part of Crate and Barrel's Brighton Collection. 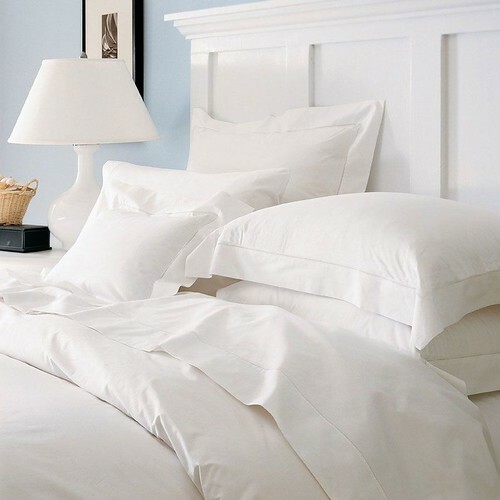 To keep that spa-like feeling, I think I'll top it off with crisp, classic white linens like these from Sferra, but mine will probably come from Ross. You can't beat their prices. I mean, you could pay more, but why? I love how fresh white bedding looks and with our dogs we need something that can be laundered often and still look great. If they're good enough for the finest hotels, they're good enough for our new master retreat! So there you have it, our initiation into the Weekend Warrior Club. This is going to be so much fun! Are you feeling it?